As we celebrate the Feast of Our Lady of Mount Carmel on the 16th July, we ought to reflect on the central importance of the contemplative Religious Orders, always regarded as the Church’s “power house”. If not already enrolled in the Brown Scapular, it’s important to make the effort now. Things are developing speedily in the world and the Church – I’m sure we’re all aware that we all need all the spiritual help we can muster. The priest at St Andrew’s SSPX chapel in Glasgow will be enrolling those who wish to be enrolled in the Brown Scapular after Mass on Sunday next, 19th July. Mass begins at 9.45.a.m. I’m sure there will be scapulars on sale in the little shop if you don’t already have one. However, any priest may enrol in the Brown Scapular and the procedure is set out here – just scroll down to reach it/print it off, if you think you know a priest who will conduct the enrolment. « New Auxiliary For Glasgow – But Why Doesn’t Archbishop Tartaglia Resign? Now, folks, if that doesn’t make you want to rush to be enrolled in the Brown Scapular, nothing will ! So, if you’re not yet enrolled in the Brown Scapular, I strongly recommend that you do so asap. You know it makes sense! That’s absolutely beautiful – I always loved Pavarotti and I always love the Ave Maria sung like this, so put them together and it’s a wonderful combination. Well our whole family are enrolled and for the most part the kids never forget to put them back on after a shower. Easy to heck: at the end of dinner after Grace, at the pointing when I’m distributing the chores: dishes, pots, hoovering, table etc – I say, okay show me your scapular 🙂 If you not wearing it, look out! Also the book on the Brown Scapular from L’Abbaye St Joseph in Flavigny http://www.traditions-monastiques.com/en/english-christian-catholic-books-shop-prayers-confirmation-gifts/68-garment-salvation-scapular-lady-mount-carmel-l1106e.html is very good. I also draw bloggers’ attention to this traditional Carmelite community who are building a new Carmel in the wilds of Wyoming USA. http://www.carmelitemonks.org They have a Guild of Our Lady of Mount Carmel which lay people can join. 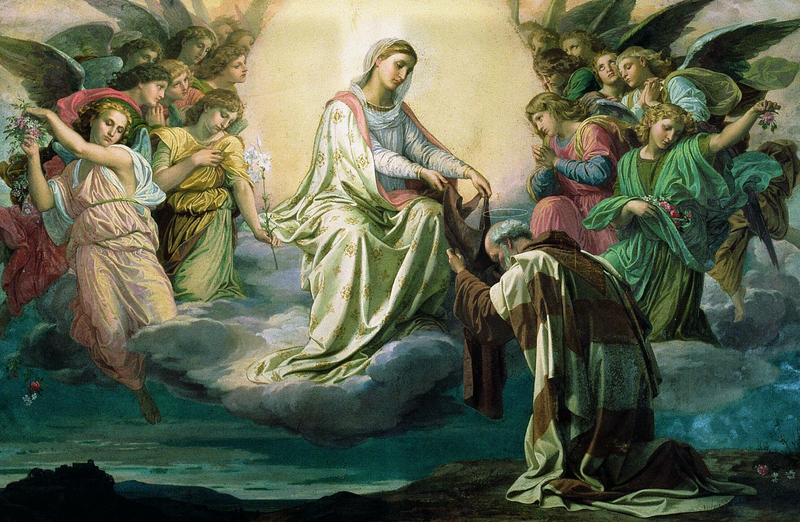 A blessed Feast day of Our Lady of Mount Carmel to you all! Don’t forget that all those enrolled in the Brown Scapular can get a plenary indulgence today under the usual conditions. I’ve just finished reading your first link – the Fr Rafferty talk – and it’s really fascinating. I won’t spoil it for others, but the account of the airport incident really brought on the goose pimples ! It’s clear from Fr Rafferty’s meeting with Sr Lucia that the scapular is essential. I’ll check out your other links tomorrow at some point. We’re only a few minutes away from the 16th, so allow me to be first to wish everyone a very happy Feast of Our Lady of Mount Carmel ! I, too, was very moved by Fr Rafferty’s account of his visit to Sr Lucia. It was all so providential. I also had goose pimples when I got to the bit about the airplane overbooked. That was just amazing. For all the times I’ve travelled on planes, I’ve never known that to happen, not once. I can’t remember the conditions for a plenary indulgence but I expect going to Mass is one, and it’s too late now. I must remember for next year. During the fourth Apparition on Friday 19th February 1858, an ever-increasing clamour rose up from the direction of the River Gave which sounded like a town’s main street on market day with the shouts and yells of human voices intermingling with the braying and squealing of animals. The shouts however became more strident and ever fiercer until one voice louder than the rest could be heard bellowing “Away with you! Get out of here!” Our Lady herself then intervened and momentarily glanced in the direction of the infernal noises – and at once, there was total and absolute quiet. What are the chances of that being referred to in an R.E. lesson nowadays? Virgin Most Powerful pray for us! WOW ! Spudeater, I’ve never heard that before, and I’ve been to Lourdes a couple of times. No chance of that being taught in RE – I was telling a friend in Ireland recently that the syllabus for the GCSE Religious Studies paper in England specified the shrine at Knock for students to study under the heading of “miracles”. Given that Our Lady didn’t say a single word, I thought that choice very telling. I mean, wouldn’t you expect Fatima, or at least Lourdes to be allowed as an option? Clearly, the policy is, least said about Catholicism (including by Our Lady!) the better ! Yes, I remember reading that about Lourdes many years ago. Also, some people aren’t aware that Sister Lucia didn’t actually see the Solar Miracle at Fatima. While it was taking place she saw a tableau of visions instead, which all Fatima experts believe represent the Mysteries of the Rosary. Firstly she saw the Holy Family (Joyful Mysteries), then Our Lady as Our Lady of Dolours (Sorrowful Mysteries), then Our Lady as Our Lady of Mount Carmel, holding out the Scapular (Glorious Mysteries). I also read somewhere that Lucia’s mother did not see the miracle of the sun – presumably because she refused to believe in the Fatima apparitions. My parents (+ R.I.P.) were married on this day, in 1948. A double feast day for me. That’s a lovely day for a wedding, the Feast of Mount Carmel. I wonder if they chose it out of devotion to OLofMtCarmel or was it coincidental? Just a coincidence, I think. But Our Lady may well have had some ‘input’, considering my dear mother’s name was Mary – and I was born on 22nd August (’54), the Feast of the Queenship of Mary! Can anyone tell me about the conditions for wearing the medal instead of the scapular itself? I don’t think I can wear the scapular on account of a sensitivity to wool next to the skin, but when i asked a priest he said I needed ‘permission’ to wear the medal instead, and I rather gathered that he thought i should put up with the rash! Q. How should the Scapular be worn? I’m never sure how much of this kind of advice is personal opinion, so my own thought is that if you take a rash wearing next to the skin and can’t wear outside for good reason, then you should just ask a priest for permission to wear the medal. I know someone who has to wear the medal rather than the wool scapular. She presumably obtained the necessary permission – I don’t think the fact about the medal “never [having been] noted for any miracles…” is relevant. I don’t wear mine in the hope of a miracle, just of avoiding Hell! And there are those who would argue, I know, myself included that that WILL be a miracle! Just think – Our Lord died on the Cross to save a sinless world from a non-existent hell. The Church is surely redundant. Thank you for that, Nicky and WF. I’ve been looking for scapulars on the internet and am now confused. I thought they had to be made of wool ( which is the problem), but some of those advertised seem to be of other fabrics and even leather. Why didn’t he give you permission? He must have known you wanted it. Frankier, I mentioned it in the narthex after Mass when there were other folk wanting his attention and so he just answered rather absently and passed on. I wasn’t too bothered at the time, but this thread has made me realise that I should be. Where do you get a priest nowadays that would be willing to initiate someone in the brown scapular without them thinking you were going a bit weird? If you did manage to get one, you are then left with the problem of actually making contact without forcing your way through a battalion of admirers. You know, the “oh how are you getting on Father?” type who make a beeline for the priest after Mass. So it makes it an even tougher old world in which to be saved. I had that problem so I decided to just print off the prayers etc from the internet, asked a priest I knew if he would do the enrolment, said I would provide everything he needed and he said yes, without any problem, just asked me to give him the stuff from the internet in advance so he could read it up. Some priests are not as averse as you might think to this sort of thing, if they’re asked by lay people. They just haven’t been trained about sacramental and haven’t been taught their importance. Personally, I think they’re probably quite pleased to be asked this sort of thing. You could print off the ceremony from the internet and put it in an envelope to give to your priest and ask him if he would let you know when he could do this, maybe offer to wait after Mass some time that suits him. It’s worth a try and you might even open his eyes about it. Priests have heard about Fatima but I think the ones who know about the Brown Scapular will be few and far between. I wish, as they say. My parish has no resident priest and is served from the nearest town 8 miles away. The vigil Mass on a Saturday takes place only an hour and a half before the Mass in his main parish so it doesn’t leave him much time to offer up Mass and travel back home, so detaining him ,even for a few minutes, would be out of the question. Anyway, I asked two different priests on three occasions to bless my daughter’s flat and it still has to be done. My daughter isn’t interested any more now as she has left the Church. This type of thing didn’t do much for her “faith”. I sympathise with the problem of trying to get a priest, but I think this is so important, if I were you, I would make whatever effort and travel as far as was necessary in order to get it done. For one to just pop down the road and get enrolled would be pleasing enough to Our Blessed Lady, but imagine the graces one would receive if a big effort were made – even having to travel to the nearest biggest city – in order to get it done. Our Lady is never outdone in generosity, that’s for sure. And where there’s a will, there’s a way. Do you ever go on pilgrimages or retreats? Perhaps that would be a good time to get it done. 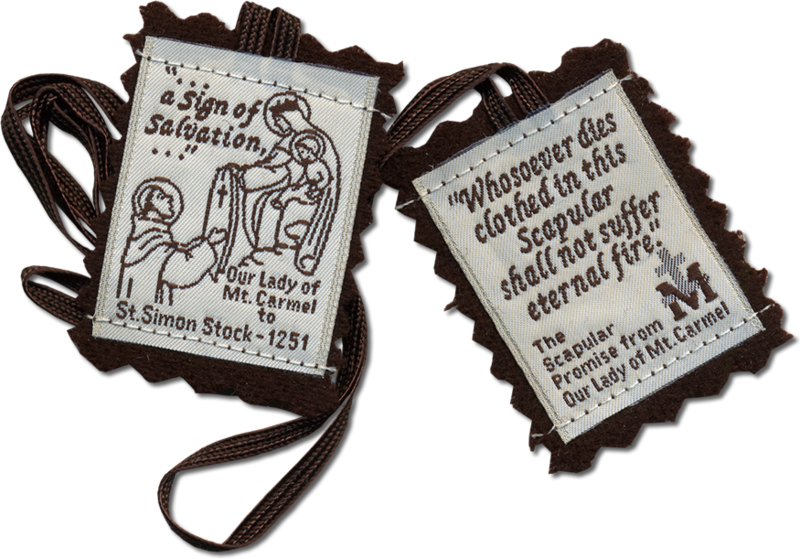 For anyone else having difficulties getting enrolled, you can buy a Brown Scapular yourself, and print the prayers of enrolment from the internet here:- http://www.freebrownscapular.com/brown_scapular_enrollment.html . I find its best not to try and catch priests after Masses, as you’ll never get their full attention. Ring a local priest up and ask if he will enrol you in the Scapular at a time mutually convenient to both of you. Or even after confessions (provided there is no-one else waiting) – it literally takes a couple of minutes to do. Failing that, the apostolate ‘A Day with Mary’ http://www.adaywithmary.org has enrolment in the Brown Scapular at all of its weekly events, and the London Rosary Crusade of Reparation http://rosarycrusadeofreparation.blogspot.co.uk also has enrolment in the Brown Scapular at its annual event. I do wear a scapular at present but I have found that they break easily. My present one has held together quite well since I did a repair job on it myself. The fact is that when I first encountered the scapular a few years ago, if I remember correctly, you just bought one in the church and wore it after having it blessed. Those were the days when we wore the Sacred Heart pin on our lapels and proud to proclaim our faith. I can still picture the young Irish labourers on the sites where I worked, stripped to the waist and the scapulars in full flow when they were digging the foundations. Changed days, I can tell you. I remember getting a couple of scapulars a few years ago from a visiting priest at a First Saturday devotion but my memory isn’t good enough to recall if we were enrolled that day although I feel he would hardly have handed them out without doing so. Could you tell me if a scapular needs blessed when being replaced? No, the blessing from the first Scapular is transfered to the new one. I think you ought to ask to be enrolled in the Brown Scapular, just to be sure. I loved the image of the Irish labourers with scapulars swinging, and it reminded me of the Catholic boy who won the boxing medal at the Commonwealth Games in Glasgow. He had his scapular swinging! It was a joy to behold. No. Once you are enrolled, you don’t need subsequent scapulars to be blessed, although you can get them blessed if you want to. I use the Scapulars from Carmel Books and they are very hard wearing and long lasting. I know some of the other ones can be a bit flimsy and break very easily. Depending on your age, you may well have been enrolled as a child and just didn’t remember – but best not to chance it. Usually if there is an enrolment at Mass, the priest doesn’t just automatically enrol everyone present, as there has to be a desire to be enrolled, so people normally go up separately after Mass to get enrolled. I would search out a priest and get it done. You will receive many graces, so it’s got to be worth any inconvenience! I was enrolled 30 years ago this August in the Carmelite Church, Kensington. I can remember it so vividly – but don’t ask me what I did last week! Thanks to you and Petrus for your help. I might ask one of the priests who conduct the First Saturday devotions, that is if they last much longer owing to falling attendances. They seem to be the only ones now whom I would feel comfortable approaching. The photo of Pope John Paul 11 does bring back those memories almost exactly as they were. I don’t think though that any of the young men I remember would have become a priest in the modern day Ireland, far less Pope. Frankier, it was an SSPX priest and he used to enrol folk in the brown scapular regularly!!! As far as I remember he was preparing to enrol the following week and I wasn’t wanting to wear the woollen scapular because of the wool sensitivity. But you’re right – one can never get a word in after Mass because of the priest-monopolisers – I expect all parishes have them😬. Anyway, thanks to everyone here I now have all the answers and have ordered two from Carmel (thank you, WF). I’ve worn the scapular medal for years because the woolen ones made me itchy. A priest told me that one could make that decision oneself without formal “permission”. I have found that the wool scapulars when washed -even before you start wearing them-, soften up nicely and aren’t uncomfortable even in hot weather. Maybe washing them gets rid of the chemicals or additives or whatever they’ve used in the process of making the woolen fabric? I was once told that Fr. Thomas Merton died in the shower WITHOUT his scapular on. I found the implications of that very chilling seeing that Father is reputed to have “gone off the rails” somewhat. May God have mercy on his soul. I don’t wear mine in the shower. I put it on right after but I never wear it when taking a shower. I know someone who keeps a spare one dry for after showering but always wears it in the shower. The example of that priest makes this seem a good idea! I leave mine on always, shower etc. I only take it off, but hold it in my hand when I’m getting my hair cut so the hairs don’t get imbedded. I had an op recently requiring general anaesthetic and I insisted they leave it on, which they did after a conversation. Unfortunately Thomas Merton was imbued with religious modernist tendencies and fell under the spell of eastern false religion. A forerunner for the VII mess of indifferentism and dialogue. The good priest Father Urban Snyder, eventually exasperated with Merton’s liberalism, came over to the SSPX and assisted ++Lefebvre in the early days that were so important in getting Tradition safeguarded against the assault of modernism. Good advice indeed! It is recorded in the life of Pope Pius IX that upon his election to the papacy, whilst being assisted to change into the pontifical garments, someone tried to remove his brown scapular. Pius immediately protested: “leave me Mary, lest Mary should leave me”. He wouldn’t permit even a temporary removal of his scapular. Thank you Editor for this post on the brown scapular, and the information on enrolment – I joined the impressively long queue at SSPX Holy Mass in Glasgow this morning, and will be attending this mass (instead of the FSSP mass) from now on. I had just completed the Louis de Montfort consecration on 16th July, which followed naturally from the first five Saturdays, Our Lady takes us by the hand, thank God. Now I wonder if the Novus Ordo which I attend locally on weekdays is worth persisting with, since the parish priest there has told my C of E friend that he has no provision for receiving converts. What on earth do novus ordo priests do all day? SSPX Holy Mass in Glasgow this morning, and will be attending this mass (instead of the FSSP mass) from now on. That’s great news – welcome to St Andrews, Sarah! Nah! Depending on how far your journey is, I would recommend attending the St Andrews weekdays masses instead. (lately the midweek schedule was disrupted a little, as one of our priests has had to help out in North England, but it seems things are settling down already). If the travel is reasonable, I would recommend you go to midweek traditional masses, instead of the novus ordo. Good question. I think a lot of them sit on useless committees about climate change and ‘justice’n’peace’ and ecumenism and interfaith issues . . . . but what you said is terrible – no provision to receive converts? God help him. It’s one of the finest things he could do. But it’s not unheard of. I was once informed by an ex-Anglican vicar that when he was considering converting, he was told by a ‘Catholic’ BISHOP (now retired) to stay where he was. Scandalous. He did come over eventually, but anyone who tries to discourage souls from converting will have an awful lot to answer for. I know what you mean . . .
I’m absolutely delighted that you joined the queue at St Andrew’s SSPX chapel to be enrolled in the Brown Scapular yesterday morning. I second the advice of Gabriel Syme – I would make the switch from novus ordo to Traditional Latin Mass, cold turkey. Freezing cold, in fact! If you keep attending the NO, you will not benefit in the same way from the TLM. I once read a book of interviews with 17 priests who learned the TLM and several of them commented on the difficulty of saying both Masses. One actually admitted that after a while he got to HATE the novus ordo. Best to make the switch, and, if you can manage to attend any or all of the weekday Masses in St Andrew’s, to do so. Again, great news that you went along on Sunday – hopefully, we’ll get to meet you soon, if not next Sunday. Thank you for the warm welcome, and thanks to all who responded with kindness to my post. I’m off on holiday at the end of this week, and look forward to meeting you, Patricia, Gabriel, and other SSPX regulars in August at St Andrews Sunday Mass. My name is Maureen. I understand how one can come to hate the Novus Ordo, it certainly seems to be having a dulling effect on both laity and priests. So, yes, I’ll check out the practicalities of getting to TLM on weekdays, Saturdays are fine for me. Enjoy your holiday and be assured that we are all looking forward very much indeed to meeting you on your return. “Our Lady takes us by the hand, thank God”. Indeed she does. But we must be prepared to go where she guides us, and you have. There is no surer road to sanctity and no greater sign of obedience to God and the Magisterium of the ages than fidelity to the ancient Mass of the saints and martyrs. It has been my experience that the greater number who have this unmerited grace are conspicuous by a particular devotion to the Mother of God. Sarah, welcome to both the blog and to the Mass of Ages. You ask what Novus Ordo priests do all day. I used to wonder that myself so I set out to keep an eye on our incumbent. I discovered him (depending on which one it was at the time) involved lots of activities. If he was an energetic priest, he’d likely be involved with social issues, meetings about ecumenical events or even home visits. Just like any good vicar or minister. If he was lazy, as several of ours have been, he’d be playing games on his computer, watching films and playing with his extensive train set or spending the parish funds on dining out. I jest not. We only had one who actively promoted devotions etc., and he was shifted pretty smartly when the bishop heard about his evangelising activities. I really resent these parasites being funded by the laity. Scottish parishes in the Central Belt were built by the sweat of poor Irish immigrants who clung dearly to the Faith. So now, by and large, they (the parishes) have plenty of money which they squander on vanity projects (Italian Garden, ugly painting by Howson), endless trips here and there and so it goes on. He (St. John Ogilvie) suffered terrible tortures, including being kept awake for eight days and nine nights, in an attempt to make him divulge the identities of other Catholics. Nonetheless, Ogilvie did not relent; consequently, after a biased trial, he was convicted of high treason for refusing to accept the King’s spiritual jurisdiction. As a martyr of the Counter-Reformation he was beatified in 1929 and canonised in 1976. He is the only post-Reformation saint from Scotland. The church also contains the National Shrine to Saint John Ogilvie, S.J., a Scottish Jesuit, who was canonised on 17th October, 1976 by His Holiness Pope Paul VI, having suffered martyrdom in Glasgow in 1615 during the Scottish Reformation. As you say, it is horrible that attempts to distort the truth about St John Ogilvie’s martyrdom are being made by Catholics, including Bishops and Jesuits, in the interests of making common cause with the followers of false religions. Perhaps, those who lie are being exposed for what they are, and that’s a good thing. Charity obliges us to consider that they may be simply mistaken, but the possibility of diabolical disorientation or wilfully misleading the innocent must be considered. So you are right to put the record straight. I agree with you about how the generosity of working class Glasgow catholic immigrant families has been squandered by the archdiocese. It is absolutely shocking the way the martyrdom of John Ogilvie is played down in the archdiocese of Glasgow and probably up and down Scotland. It’s shameful. No wonder the Scots bishops are being forced to admit that Scotland is now a mission land. Shame on them. We do not endorse the writings of John Haffert on this blog. The Blue Army went off the rails and led people astray about Fatima and the Consecration of Russia – John Haffert’s book are not recommended here. Far from it. Please do not post any more links to his material. I would remind readers that the only reliable source for information about Fatima is the Fatima Center Every other source that I know of, is suspect. Click here to read one report which details John Haffert’s insistence that the Consecration of Russia has been carried out. I will leave the links that you have posted for now, Ella, but any further links will be deleted. We take great care not to disseminate false information, so please respect our policy to promote only the Fatima Center. My apologies. I didn’t know that. Thank you Ella – you would be wise to check out all the information available about John Haffert and the Blue Army on the Fatima Center website. I have no doubt that you meant well and I thank you very much for contributing to this blog in that spirit. To be fair, Ed, John Haffert’s ‘Sign of Her Heart’ is a very good book – I have it and have read it. It was written back in the 1950’s (before the ‘party line’ on the consecration existed – in those days everyone agreed it hadn’t been done). The book was originally called ‘Mary in Her Scapular Promise’. It did untold good at the time in promoting the Brown Scapular. But John Haffert’s later books are another matter altogether, you’re quite right about that. As well as his view about the consecration, he also promoted dubious/false apparitions and mystics. But nonetheless, ‘Sign of Her Heart’ remains a good book and is worth reading. Thank you for that clarification about John Haffert. I didn’t have time to study his Sign of the Heart book but am happy to take your word for it. The Blue Army was very good originally, but, as you acknowledge, it went astray later. Just dropped in to say that Sarah did, indeed, come along to the SSPX chapel on Sunday last, the first Sunday in August, and I was delighted to meet her. We didn’t have long to chat this time, but I hope that she will be able to stay a bit longer in future. And that is very charitable of me, considering that she stated openly, for all the world to hear, that she was expecting someone younger (than me!) I mean, should she, or should she not, demand her money back? From the Charm School, I mean?